Our Liquid Laundry Detergent is tough on dirt, not the environment. Designed for today’s active families, our readily biodegradable, ultraconcentrated, enzyme-based Liquid Laundry Detergent delivers potent effectiveness against your toughest odors and stains. Using only ¼ the amount of most leading brands, it works in both high-efficiency as well as conventional machines to effectively help reduce all kinds of odors and stains with just a few pumps. You’ll be tempted to use more, but don’t—a little bit goes a long way! Your family deserves to have their clothing smell and be as clean as it looks—free from harmful chemicals, fillers and questionable “fragrances” consisting of who knows what that could be absorbed through their skin. Some detergents don’t eradicate stains and odors, and can be harsh on fine delicates. Our readily biodegradable, ultra-concentrated Liquid Laundry Detergent has been tested against the toughest odors and stains. The unique blend of enzymes easily breaks down and removes all kinds of odors and stains, getting your laundry exceptionally clean. 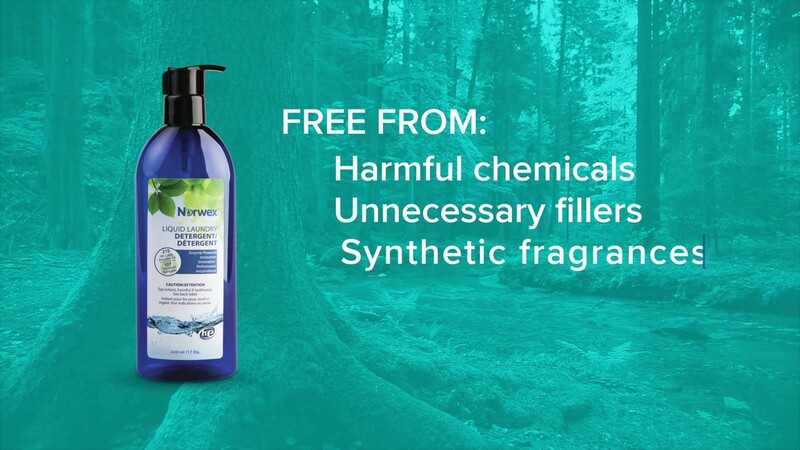 Best of all, you never have to worry about harmful chemicals or fragrances. It’s tough on dirt, not the environment. • Requires just a fraction of the amount of most typical store brands. One bottle of Liquid Laundry Detergent handles three times as many loads as a 46-ounce jug of a typical, chemical laden laundry detergent. • Using less means you save money—one bottle washes up to 215 loads in an HE machine and up to 107 laundry loads in a conventional machine. • Unique enzyme blend contains biodegradable ingredients. • Convenient pump bottle prevents spills and messes. • Pump dispenses a consistent amount every time, eliminating guesswork. • Eliminates the problem of heavy, drippy, messy detergent jugs in the laundry room. • Bottle is recyclable, HDPE #2. • Enzymes are catalysts and function similarly to the way they do within our bodies—quickly breaking down starches, fats and proteins. This makes them very effective at removing grass, sweat, blood and grease stains and more. • A study analyzing gases captured from washers and dryers that used scented detergents and dryer sheets found more than 25 volatile organic compounds—including seven hazardous air pollutants—coming out of the vents.